Women returners: Back to your future: Is a returnship right for me? Q1: Have you had a career break from your professional career for over 2 years? NO: For most programmes there's a minimum of a 2 year break (sometimes 18 months). If you're looking for another job after redundancy, statutory maternity leave or a shorter sabbatical, focus on direct hire roles instead as you shouldn't need the support package provided through a returnship. If you're finding it hard to get a permanent role, even with a short break, also consider stepping stone roles such as interim, maternity covers, temp and contract work. Q2: Are you looking for a complete career change? NO: If you'd like to use your existing/transferable skills and experience, in the same or a different sector, go to Q3. YES: A returnship can work for career shifters (into a new sector or using transferable skills) but isn't aimed at complete career changers. Look instead at study routes, strategic volunteering (or 'work experience') in your chosen sector, and at retraining programmes such as those listed here. Q3: Are you confident that you can get directly into a permanent role via standard recruitment routes? YES: If you like the idea of a trial period in a new sector, or a chance to test out whether it's the right time to return, go to Q4. If you would value the support offered on a returnship, look at Supported Hiring returner programmes (into permanent roles) and corporate returner events, or consider funding your own returner coaching. If you don't see any challenges with getting a permanent role, you don't need a returnship! Q4: Can you be flexible on flexibility of hours/location? NO: If you have strict requirements for how work will work for you (e.g. 2 days a week, completely home-based, short commute), do push yourself a bit to consider where/how you can compromise. If you're completely inflexible you will find it hard to commit to and benefit from even a part-time returnship**; you need to have the opportunity to prove yourself, be visible and upskill and it will be harder to find a suitable-level role at the end. You may want to consider freelancing or other options until you're at the point where you can commit more time to work. Q5: Can you be flexible on salary for the returnship period? NO: Returnship salaries shouldn't be minimum wage. They are typically at an experienced hire level, but may be significantly lower than you were used to. Remember that this is a fixed term (3-6 month) programme rather than a permanent role; make sure to discuss the likely level of salary for roles at the end of the programme to assess whether the cost-benefit of this supported bridge back makes sense for you. Q6: Are you proactive, positive and able to cope with uncertainty? NO: Returnships come with their own challenges. In these pilot years participants play a key role in making the programme work and you need to be proactive to make the most of the opportunity. Even though the majority of participants convert into ongoing roles, you will also have to manage a degree of uncertainty during the returnship period. If this feels too stressful and/or you don't recognise the inherent value of refreshing your networks, knowledge and experience, whatever happens at the end of the programme, then a returnship may not be the best option for you. Focus instead on returner programmes which bring you directly into permanent roles. 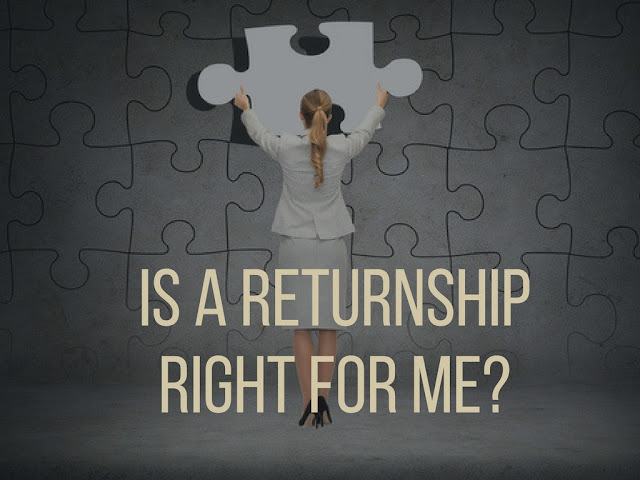 YES: A returnship sounds like a great fit for you! Look at the open opportunities on our website here.